On November the 5 of 1948 it had been decided to establish a machine building plant in north Kazakhstan according to USSR Council of Ministers Resolution #4137-1658. In September 1960 first engineering building was put in commission and preparation of first product APP-125 mechanical grain loader was started. Commodity batch of mechanical grain loaders had been produced on March the 30 of 1961. Count of Petropavlovsk plant of heavy machine building production activity had been initiated. First samples of shuttle docking car had been finished and tested on June the 5 of 1962. Acceptance committee passed a resolution about compliance with requirements to enginery products and operational integrity. Forty year period of military technics manufacturing, that was 90% of all the products have been started on PZTM. Petropavlovsk plant of heavy machine building, generated in the system of military-inductrial complex, was specialised in two directions of missiles fabricating: missiles and components & ground equipment and missiles complexes of different types. PZTM had been produced engine cases for first and second stages of missile complex "Temp-S" ballistic missile, missiles for "Tochka" and "Tochka-U" complexes, anti - submarine gravitational missiles for "Liven" complex, research rockets and meteorological rockets. 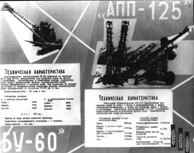 According to the USSR Council of ministers and KazSSR Council of ministers Decree concerning wheel model of self-mobile launchers batch production providing, in May 1965 first silicon of "SCUD" missile complex`s launchers had been fabricated on PZTM. In 1979 PZTM manufactured and put in armed forces first launchers and loading vehicles of "Oka" tactical complex. In 1977 by USSR Supreme Council Presidium Edict "Petropavlovsk plant of heavy-machine building" had been awarded an orden of Labour Red Banner for great services in generation, test & production of new technics. PZTM had been headquarters plant in manufacturing of complete "Tochka", "Tochka-U" tactical complexes. Missile batch production had been initiated in 1973. In 1993 - 1995 Kazakhstan Armed Forces were equipped with "Tochka-U" tactical complexes.